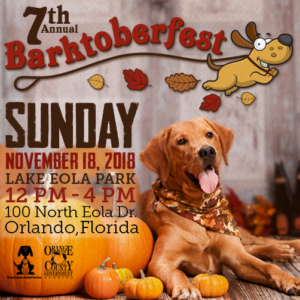 Orange County Animal Services invites you to the shelter’s free seventh annual rescue-appreciation event, Barktoberfest 2018! This family-friendly event features adoptable dogs and cats, delicious food truck cuisine, pet-related vendors and games. Details are below. When: Sunday, November 18, 2018 from 12 p.m. to 4 p.m.
What: This annual event brings together Orange County Animal Services’ valued rescue partners to highlight the life-saving work they accomplish for pets throughout the community. This year, 25 local pet rescue groups are slated to attend – representing pets of various breeds, sizes and ages available for adoption. In addition, more than 15 vendors will offer various services to attendees and food trucks will be available. Special Deals: Orange County Animal Services is offering free pet microchipping and rabies vaccines to Orange County residents during event hours. The Pet Alliance of Greater Orlando is offering low-cost vaccines and heartworm disease tests during event hours. Media Contacts: Alyssa Chandler, Orange County Animal Services Public Information Officer, 407-405-7782; Diane Summers, Orange County Animal Services Program Manager, 407-600-5714. More information can be found on the Facebook event page here: http://bit.ly/Barktoberfest18.